As I write this I’m sitting in the beautiful garden of the former Governor of the Leyte Province. The Larrazabal Family is the organizer of the 5. 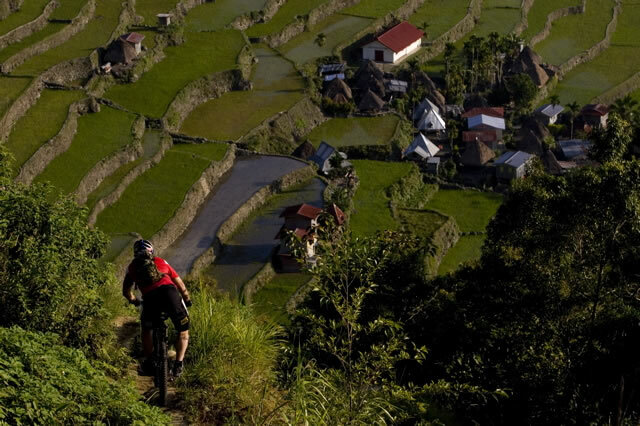 Terry Larrazabal Bike Festival, one of the biggest cycling events in Southern Asia. I was invited to the festival as special guest, ambassador and trials showman. I decided to ride my bike prior to the festival to some of the incredible natural sites in the Philippines, little did I realize what the Philippines had to offer in terms of mountains, volcanos and over 7100 islands. This wasn’t a typical “Hans Rey Adventure Team” trip, it was more like a road-trip, consisting of several mini-adventures. For the majority of the trip I was joined by Italian photographer, Marco Toniolo, and a local videographer. Goyo, the organizer of the festival and my host, prepared a great plan of action, that left little room to breath but plenty of room for incredible memories. March 22.-24.: After a 16 hour flight from Los Angeles to Manila, I arrived at 5:30 am. A couple hours later Marco arrived from Germany and immediately we went to a press conference at the National Tourism Office. With an hour and half delay, which is considered on time in the Philippines, we started our well attended press conference. 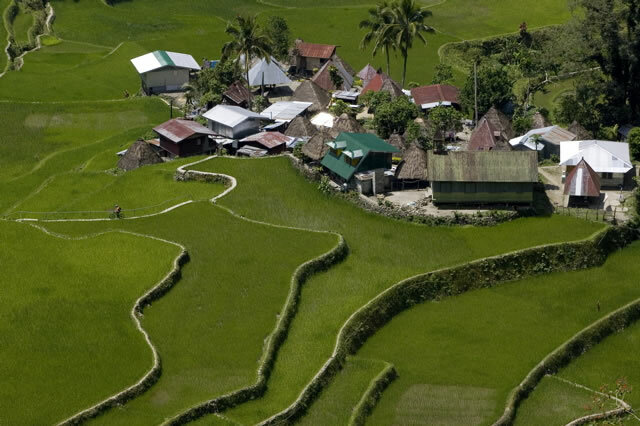 In the afternoon we got ready for our trip up north to the Mountain Province and the world famous Banaue Rice Terraces, considered the 8th World Wonder and a UNESCO World Heritage site. But first we had another live TV appearance before we started our 12 hour all-night drive. Talking about jet lag, we didn’t have a chance to even think about it. Thirty minutes outside of Manila the nicely paved express way ended already, and the rest of the trip was an windy and dangerous mountain roads. In the middle of the night I was woken up, as our car all of sudden did a u-turn and drove back. One of our support vehicles had come of the road and flipped into a riverbed 25 feet below! The car and the two bikes on top (luckily not mine) were totaled, miraculously the two passengers were unhurt. I brought two bikes with me, just to be ready for any situation, a GT i-drive 5 all-round bike and my new GT – Hans Rey signature trials bike (frame). 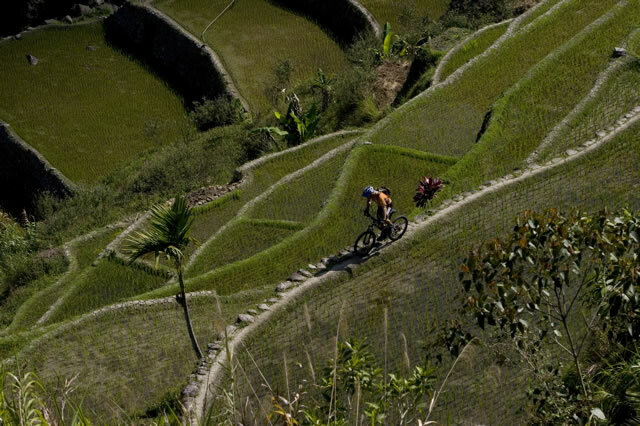 With a reduced crew we continued our trip, in the morning we arrived near Banaue from where we started immediately our first bike tour to the remote village of Batad, where, for the past 2000 years, locals had carved beautiful rice terraces into the surrounding hillsides. It looked a lot like the terraced Inca hills near Machu Picchu, Peru. First we had to climb a long dusty Jeepney road in the brutal mid-day heat. But then we descended on a beautiful footpath into the small village of Batad, where people live in primitive huts, most them without electricity, running water, etc… Needless to say, we went to bed shortly after dark around 7:30pm in a simple backpackers hostel. March 25.: With the crack of dawn and the call of the roosters we awoke in the midst of the ‘rice terrace amphitheater’. 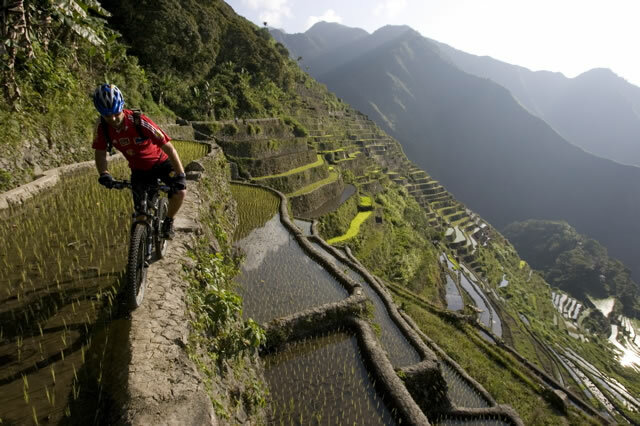 My first goal was to ride to the beautiful waterfall on the bottom of the valley, about 100 levels of terraces below. It proofed to be very tricky to ride along or down the terraces, many sections, very steeper than I could ride without a death-wish. The narrow dirt path’ along the edges were uneven, nerve-wrecking, and ready to grumble under my tires. The waterfall was a long way from the top of the mountain range we had to still climb, before we could make our way to the next stop. 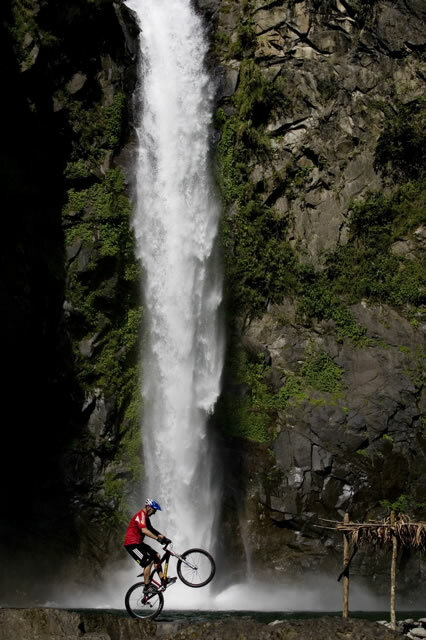 Sagada, known as one of the adventure capitals of the Philippines but too far off the beaten track for most people to ever make it there. 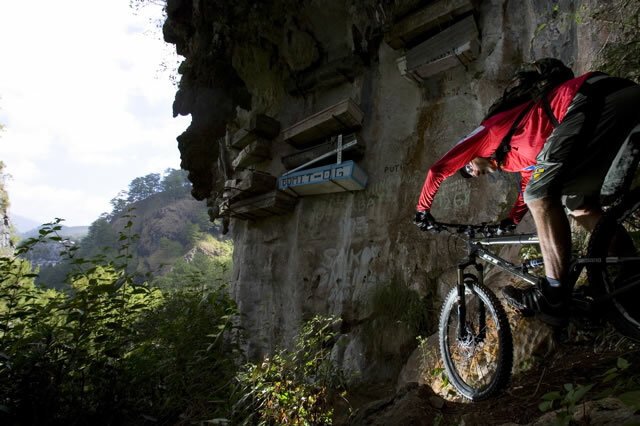 The weather was brutally hot and some local riders showed us to their favorite trails. First we went to a place called Echo Valley, site of the ‘Hanging Coffins” a sacred burial area surrounded by limestone cliffs, it was very eire and after my experience with the spirits several years ago in Borneo, I was extra cautious and respectful. Some of those coffins are 500 years old! 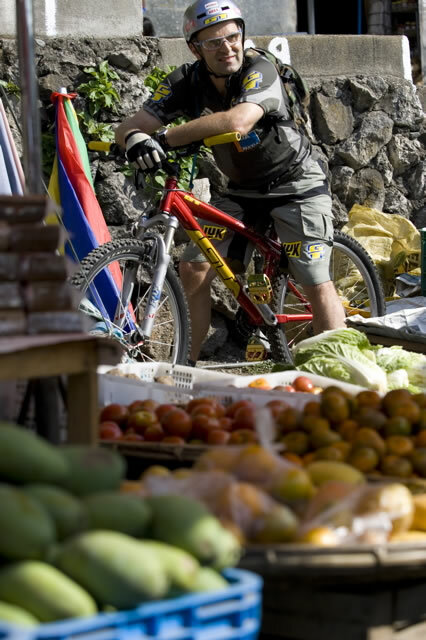 We proceeded to the local market, to buy some tropical fruit for breakfast, before heading to a wonderful trail in a pine forest that led us to some gigantic caves. Later that afternoon we found ourselves once again cramped in the Toyota Defender for another 12 hour drive back to Manila. The roads can be quite scary and sketchy, the drive back was more stressful than riding the steep rice terraces. March 26.: Today was a trials show in one of the biggest shopping malls of Manila. The turnout was incredible, I couldn’t believe how big and enthusiastic the local biking scene was. The people were so happy to meet me and have their photo taken with me. As I found out, many of my past adventure team trips are constantly being televised on the Discovery Channel Int.and other TV networks. People brought all sorts of foreign, especially american, biking magazines to be autographed, it was quite nostalgic to see some of the 10 – 15 year old features and ads. March 27.: Another media day, 5am wake-up call for an appearance on the biggest morning TV show. Jumped over some Jeepney’s, the classical, colorful Philippine mini buses and over a transvestite TV host. Next was a hour long live interview with the “Larry King” of the Philippines, broadcasted worldwide on Philippine networks. Enough of the big city! It was time to hit some more trails, next up – the active Taal Volcano and its crater lake. March 28.: We got an early start to climb Taal Volcano. First we had a fun descent to the edge of the first lake, from where we boarded a small boat, that took us to the island. It was a hot and dusty mission. The one hour hike and bike was on a sandy horse trail, and despite all the trash along the way, it is a favorite tourist attraction. Once we reached the top we were rewarded with a fresh coconut and a awesome view of the crater lake. This volcano is on and off active, and we could see the smoke from several cracks in the earth and smelt the sulfur in the air. 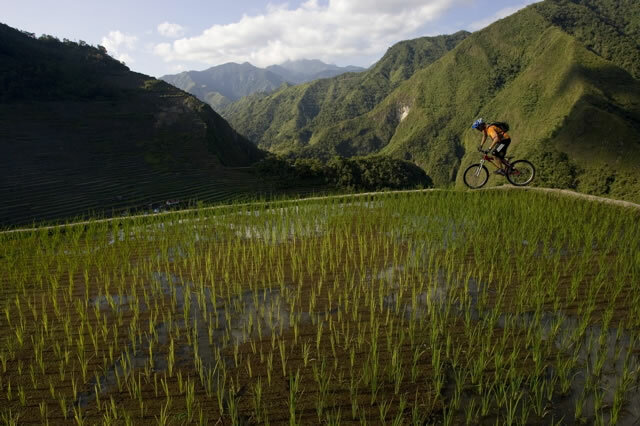 Four local riders joined me on this trip, mountain biking can be considered an upper class sport in the Philippines – however; the bikes, skills and attitudes of the locals weren’t any different than from any other biker around the world. 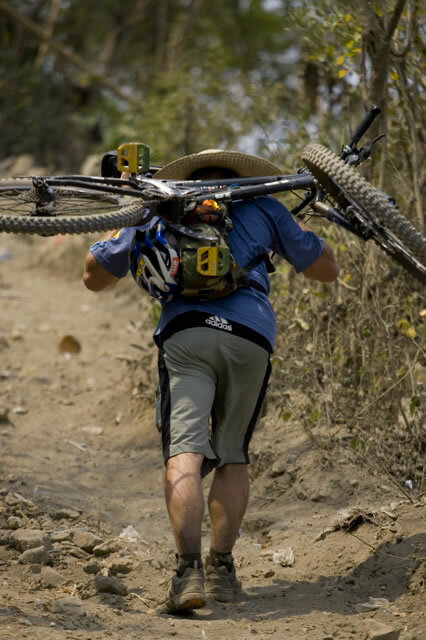 I guess mountain bikers have all similar genes? The downhill was a good laugh and worth the efforts. March 29. 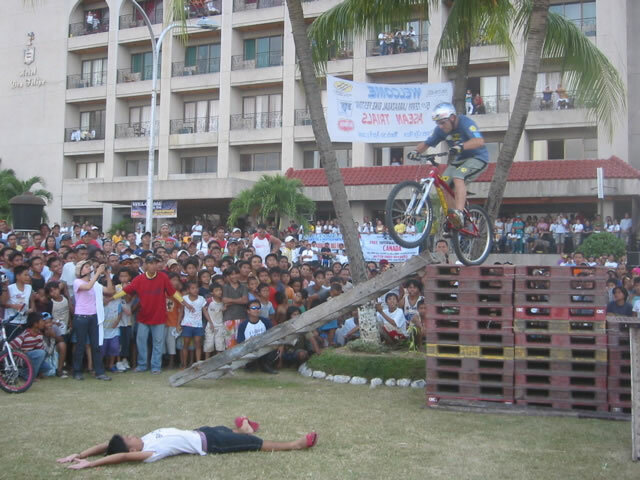 – April 1.: Marco had to fly back to Munich, due to prior obligations, for me it was time to fly to Ormoc City in the Leyte Province to attend the Terry Larrazabal Bicycle Festival (www.tlbf.org). This is a big familiy event, purely fueled on passion. They have sixteen races in 4 days, basically a mini Sea Otter. 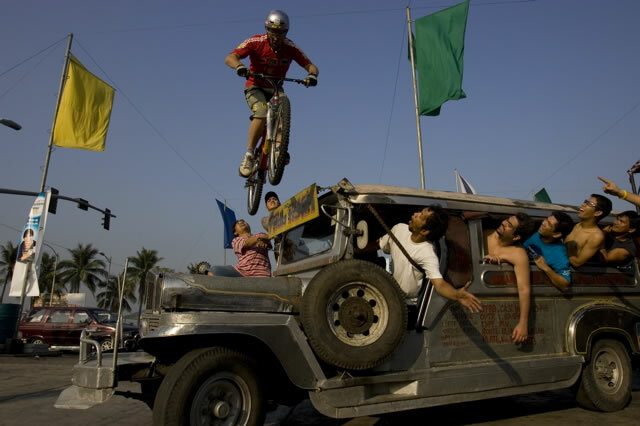 From a 3 day road stage race to XC, 4X, DH, SuperBMX, Freestyle, Fun Rides and the first ever trials comp in the Philippines. Nearly 600 entries from 7 countries. 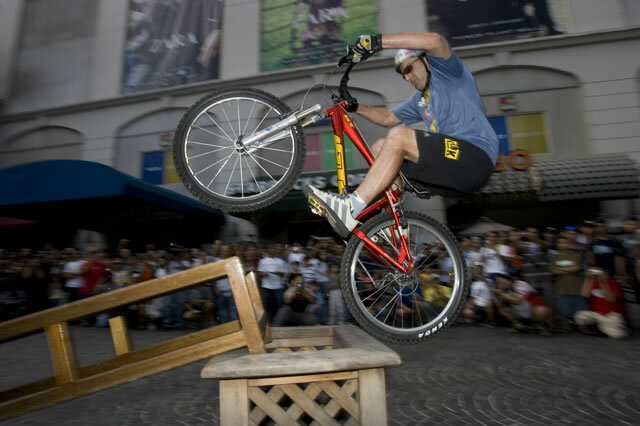 Its a great event and everybody has lots of fun, reminded me a lot of the early days of mountain biking in the US. This place is beautiful! Nice beaches and surrounded by mountains and coconut and banana tree forests. The fun ride was at a idyllic lake in the mountains, with 80% single-trail. The trail was guarded by local military, due to ongoing NPA guerrilla rebel encounters and kidnappings, but usually the rebels are most active only in the very south of the Philippines all other islands are pretty save. I pulled a muscle in my back and got some treatment from the local doctors. April 2.: Today was the grant finale and award ceremonies for the festival. I used the opportunity for my non-profit charity, ‘Wheels 4 Life’ (www.wheels4life.org), and presented 12 bikes to the Bishop of Southern Leyte who will distribute the bikes to some of the survivors of the recent devastating mudslide, where the majority of the villagers (over 1000!!!) were buried alive. I also gave some more bikes to families in need of transportation near Ormoc where we had the festival. For me it was a great joy giving these bikes out personally, especially since it was the first time since I had started my charity. I hope many thousand’s of bikes will follow these ones. April 3.: Time to go back home, the Sea Otter starts this week. This was a great trip with lots of good riding and great people. 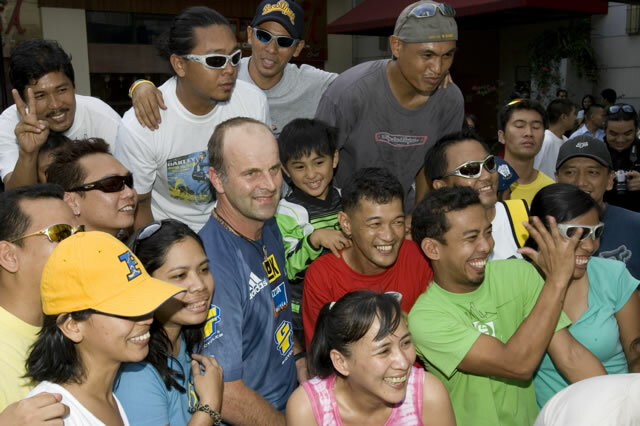 Everybody, in the Philippines is super friendly and seems very content, no matter how their standard of living is. 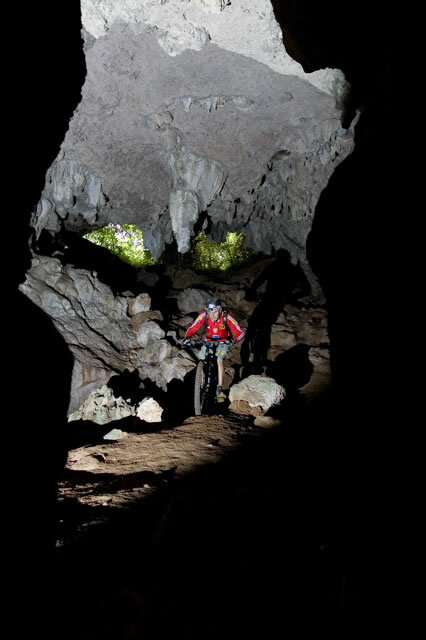 This country and its people are on the rise, well worth a trip not just for bike riders. 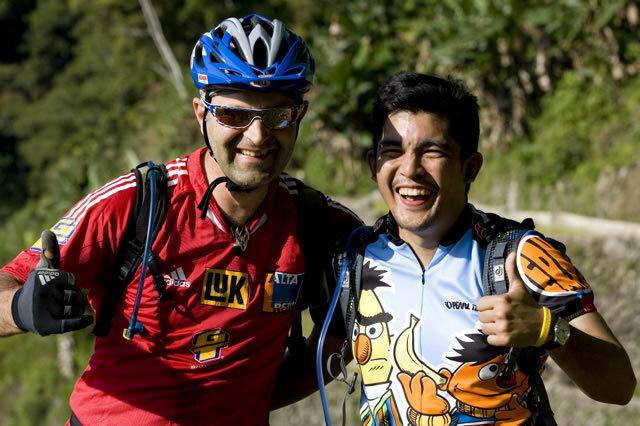 Thanks to Goyo and his family and all the bike riders of the Philippines.